The Sentinel Plant Network is a collaboration between the National Plant Diagnostic Network (NPDN) and the American Public Gardens Association. The partnership extends the scientific and training expertise of the National Plant Diagnostic Network through thousands of public garden professionals, volunteers and visitors to improve the country’s ability to quickly detect and respond to serious plant pests and diseases. The program is funded through cooperative agreements with USDA's Animal and Plant Health Inspection Service (APHIS) through the Farm Bill, Section 10007 and, since its launch in 2010, has grown to include more than 240 gardens across North America. Public garden staff and volunteers are well positioned to contribute observational data that improves our understanding about the distribution of serious plant pests and diseases and help identify emerging threats because they are intimately familiar with and maintain detailed accession records about the diverse plants under their care. The Sentinel Plant Network enhances this capacity by providing training and monitoring resources and engages front-line horticulturists to scout their collections. 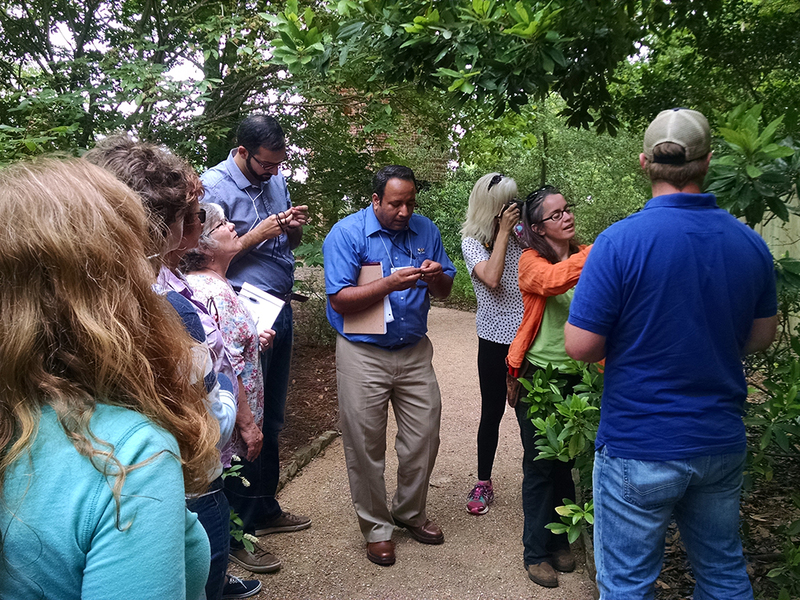 To date, the Network has conducted 26 workshops to train more than 500 public garden staff in basic plant diagnostics, significant pests and diseases in their region, potential threats, and best practices for monitoring their holdings. These events have also provided a valuable opportunity for the Sentinel Plant Network to build relationships between the public garden community, diagnosticians and regulatory officials so they can work together more effectively on the front lines of early detection. In addition to these in-person trainings, the Sentinel Plant Network engages its members year-round through geo-targeted scouting alerts. These alerts contain actionable information about what garden staff should be on the lookout for, phenological cues, host plants, common symptoms, and links to the program’s threat-specific monitoring checklists and visual aids. When a plant captures a garden visitor’s interest, it creates a unique informal learning opportunity to educate that person on subjects related to forest health, invasive species and plant conservation. 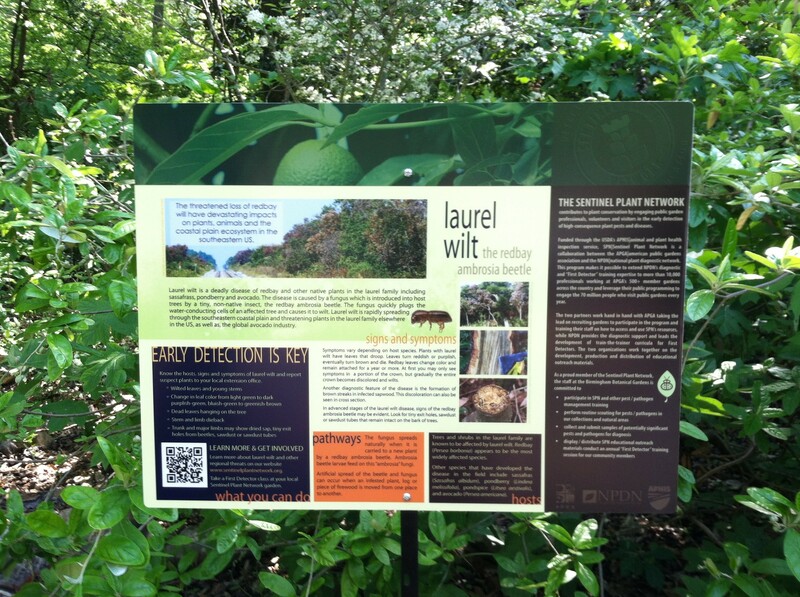 The Sentinel Plant Network capitalizes on this opportunity by developing eye-catching interpretive signage and plant labels featuring high-consequence pests and diseases. At a glance, visitors can learn about the threat and its impact, steps the public can take to help prevent its spread, and the importance of early detection, rapid response and regulatory action. To date, over 700 of these pieces have been deployed at more than 75 member gardens where they have the potential to reach over 10 million visitors per year. Public gardens can engage new audiences to get involved in early detection efforts as citizen scientists. Besides reaching visitors as they walk through their plant collections, public gardens also serve as centers for formal education in their communities. The Sentinel Plant Network leverages this capacity by providing member gardens with curriculum materials that they use to encourage class participants to get more involved by becoming a certified member of NPDN’s First Detector Network. To date, Sentinel Plant Network gardens have delivered this content to thousands of program participants. There have been numerous early detections by Sentinel Plant Network gardens over the past five years, but the recent events at one member garden in particular truly epitomize the full capacity that public gardens play in early detection and rapid response efforts. In early 2014, Sentinel Plant Network garden, Bloedel Reserve, submitted a plant sample to Washington State’s NPDN lab that was subsequently diagnosed as positive for a significant pathogen. The garden worked closely with officials from the Department of Agriculture to conduct a delimitation survey to identify all additional infected plants on garden grounds so that they could be destroyed, implement Integrated Pest Management (IPM) practices in affected areas, and assist with a “trace-back” investigation. The garden continues to train their staff and educate visitors on sanitation practices to mitigate the spread of the pathogen. In addition, the garden leveraged the local publicity to enroll more community members in First Detector trainings at the garden.